PM Modi was barely visible Wednesday, having spent a busy Tuesday chairing the CCS, attending public events in Delhi and Rajasthan, and riding the Delhi Metro. New Delhi: Prime Minister Narendra Modi was seemingly everywhere Tuesday, as India woke up to the air force’s strike on a Jaish-e-Mohammed terror camp in Balakot, Pakistan — he attended public events and spoke at Rashtrapati Bhavan, Churu in Rajasthan, and Delhi’s ISKCON Temple, with a Delhi Metro ride thrown in for good measure. Wednesday presented a stark contrast. 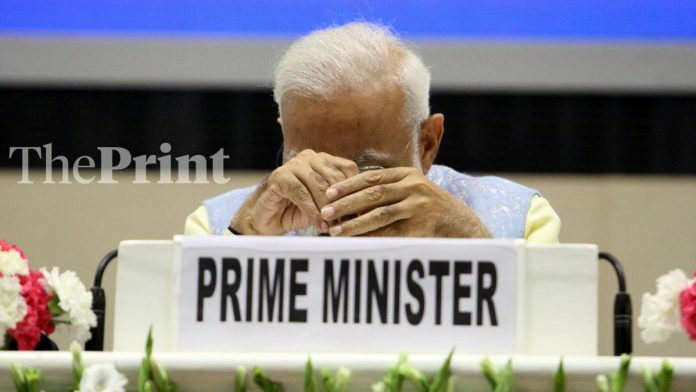 As the Pakistan Air Force claimed it had conducted retaliatory strikes, and India confirmed that one of its pilots was ‘missing in action’, PM Modi kept an uncharacteristically low-profile. To be sure, the prime minister’s schedule was decided much in advance, and his plan for Wednesday included only one public engagement. No changes were made to his programme on either day, sources in the Bharatiya Janata Party (BJP) said. PM Modi began his day by attending the National Youth Parliament Festival 2019 at New Delhi’s Vigyan Bhavan, where he started his address at around 10:30 am. He restricted his over 45-minute speech to amorphous issues and advising the youth — much like his Mann Ki Baat radio addresses. At the event, Modi also launched the Sports Authority of India’s ‘Khelo India’ mobile app, which aims to create awareness about sports and fitness. Sources said the PM then spent the rest of his day at his 7, Lok Kalyan Marg residence, attending meetings, with no other public engagements scheduled. PM Modi’s social media handles were also relatively silent Wednesday. The last tweets from the PMO handle and the @narendramodi handle came in the morning, and were to do with the Youth Parliament speech. Unlike the immediate aftermath of the Pulwama terror attack or even Tuesday, when PM Modi was seen and heard extensively through his public rallies, Wednesday saw Finance Minister Arun Jaitley as well as Home Minister Rajnath Singh take centrestage and be the most vocal senior members of the government, holding meetings and making statements. Singh chaired a meeting in the morning to review the situation and asked the heads of the Border Security Force and the Central Reserve Police Force to be on high alert. The home minister then headed to Bilaspur, Chhattisgarh, for a BJP public function. Jaitley, meanwhile, defended the IAF’s air strikes on Pakistan, claiming India could do what the United States did to Osama Bin Laden in Pakistan. “A week is too long a time for any country. If you look at last 24 hours, one week would appear to be a day. I remember when the US Navy SEALs had taken Osama Bin Laden from Abbottabad (Pakistan), then can’t we do the same?” he asked. “This used to be just an imagination, a desire, a frustration, a disappointment. But today this is possible,” Jaitley said. The United States is sui generis. Its defence budget is about $700 billion. Its intelligence budget is about $ 70 billion. There is also the question of symmetry or lack thereof. The liberty it took with Pakistan in Abbottabad, unclear if it would do something like that with China or even Russia.